One of the major themes of DPNet-Nepal is Knowledge Management. As a part of knowledge management DPNet-Nepal organizes monthly learning sharing workshops, policy dialogue publication of IEC materials and translation of national and international documents on DRR in its annual plan. The persons with disability are one of the most vulnerable groups and are disproportionately affected in disasters due to their difficulties in mobility, loss of assistive devices, access to information and social-cultural discrimination. 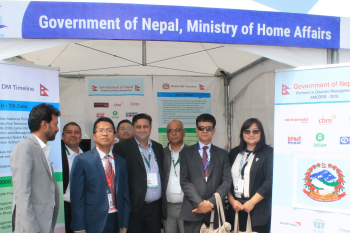 Disaster Preparedness Network Nepal (DPNet-Nepal) with support of Association of International NGOs Task Group on Disaster Management (AINTGDM), UN and other humanitarian agencies collaborated with MoHA to provide technical support in preparation and coordination for the AMCDRR 2018. The National Symposium on the occasion of IDDR 2018 was called by Ministry of Home Affairs, coordinated by DPNet-Nepal and organized by Nepal Geological Society in association with AINTGDM and various stakeholders on 13th October 2018.